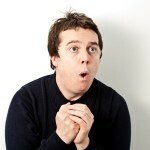 Paul McCaffrey - I want a comedy night! Paul McCaffrey has risen rapidly up the ranks scooping several awards and gaining wholly unequivocal approval Frank Skinner. Other comedians have compared him to the late Tony Hancock. Paul’s assured delivery and beautifully observed material lead to bizarre flights into silliness and darkly gleeful rants.